A Course in Miracles is a path of Awakening through relationships. A relationship given by the Spirit for the purpose of Awakening is a fast track for healing. Using all your relationships for healing is a beautiful, yet not always easy way to get to a deeper sense of what love really is and who you truly are. This involves exposing the ego and facing fear in its many forms. The result of using relationships for healing is a deeper experience of strength, love and authenticity. Here is a sample of some new ideas so you can begin to experience the healing benefits of using your relationships in this new way. Trying to Keep Everyone Happy is a Losing Game! Thank you so much for your lovely presence and patient guidance. This is the first time I am writing. Broadly my question is about loving people whose fear is constantly attempting to cage you. It is not difficult for me to love them, but it is difficult for me to live my life freely around them. In my current relationship, I feel that to keep the peace I must curtail any expressions of sisterly love toward other men. Additionally, I must show him constant admiration, affection and sexual interest or he will feel dejected. Certainly if I was perfectly enlightened this problem would not hinder me, but honestly I sometimes feel that I have a large infant attached to my back that I am obligated to tend to above all else. I had left my previous relationship for a similar reason. I am still deeply guilt-ridden at having abandoned my brother just because I could not handle his level of fear (for isn't it the most fearful that need healing the most?). It hurts me so much to think that someone would feel unloved or discarded by me, and yet I feel my only alternative is to cater to their fearful demands--to become a slave to them instead of a vessel for God's love. I sense that people are terrified of a love that is not "special," and they do everything they can to make it "special." This tug-of-war has become a great source of sorrow for me and my greatest challenge on the path back to God. I would appreciate any guidance you could give me on this matter. Thank you for writing and for sharing what is on your heart. I am so happy to hear from you. The more the ego is exposed and raised into awareness the less it is likely to be believed. Relationships which involve dependency, demands, and expectations are witnesses to the ego. Our shared Purpose will show that the ego is not real and that You are not the ego. One way the ego seems to maintain guilt is through people pleasing or looking for external agreement. This defense seems to smooth out the rough edges of a "relationship" between persons, though it actually keeps a lid on the guilt underneath and serves to hide and protect it. People pleasing is a compromise attempt at minimizing conflict while actually protecting and preserving the sense of guilt that generates the perception of conflict. The sleeping mind would not repeat this insane attempt over and over and over were it not for the belief that love and happiness and intimacy can be found in a particular form. Divine Love is Content (Spirit) and cannot be found in form of any kind. The Holy Spirit Helps shift the search for "love in form" to the search for Love within by reminding that our Will is Universal and cannot be content with form of any kind. This world is nothing more than a pictorial representation of "looking for love in all the wrong places." You wrote: "I sense that people are terrified of a love that is not "special," and they do everything they can to make it "special." Specialness is the ego's attempt to make a substitute "love" or intimacy apart from God. God creates Eternal Love as Spirit and the ego, being the attempt to deny Eternal Love, seemed to make up a person-to-person "form of love" to take the place of God's Eternal Love. The belief in and feeling of abandonment experienced in thinking about your previous "relationship" is a cover for the deep seated buried belief and feelings of abandoning God and of being abandoned by God. Working with the Holy Spirit will show you that abandonment of or by God is impossible, for Ideas leave not their Source and Christ could never leave the Mind of God. The guilt you mention seems to be related to persons on the surface of consciousness, yet the ontological guilt of believing it is possible to actually separate from God is the one and only error to be Corrected or forgiven. "Relationships seem to be a difficult undertaking in this world. They seem to be a mixture of love and hate, attraction and repulsion, joy and misery. Jesus refers to special love and special hate relationships as destructive, selfish, possessive, and exclusive. These are ego-based relationships that are songs of praise to their maker. Holy relationship is a metaphor for a special relationship that has been given over to the Holy Spirit for His purpose of forgiveness. Holy relationship is a healed relationship that reflects wholeness and completion. Beyond all metaphors, one might say that the only real relationship is one of Spirit, of God and Creation, of Father and Son. 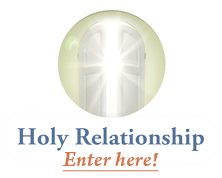 As the only real relationship is given by God, the holy relationship is learned of the Holy Spirit. As the "scarcity principle" is undone by the Holy Spirit, the sense of lack, inadequacy, weakness, and incompletion that is typical of the special relationship is replaced in the holy relationship by joining, extension, appreciation, and acceptance. I like to speak of the special relationship in the past tense, for as with everything of the ego, it is history. If we recall the metaphysics we have covered today, the sleeping mind became so terrified of the light that it attempted to hide from God in a world of form. Believing it had torn itself from Heaven, it attempted to set up a body-world self as its "new" identity. It attempted to forget about its Identity as Spirit. As it became identified as a body, it was shaky about this "new" identity because, though it had tried to forget the light, deep down it knew that it was making this world up and that God could and must be remembered. Being uncertain and afraid to go back to the light, it looked for an "external" solution -- other bodies with which it could "join" to find happiness and completion. That was how the so-called "co-dependency" of special relationships began. As soon as the mind believed it was out on the screen of the world, it sought outside itself to alleviate the guilt and fear and loneliness and emptiness it felt within. It looked for other bodies to be its friends and companions. Associations with the "right people," the sleeping mind's God-substitutes, took on great importance. The whole world became one giant special relationship, because everything that the mind associated with on the screen was set up to be a God-substitute. And the reason why special love and special hate relationships are never completely satisfying and never bring lasting peace and happiness is because there can never be a substitute for the Love of God. The holy relationship can only be experienced now as a reflection of the Love of God. It is analogous to the real world, complete forgiveness, or healed perception that I spoke of earlier. As one realizes the impossibility of personal judgment, one also realizes the impossibility of special relationships of any kind. Holy relationship, then, is not personal in the sense of bodies relating to one another. It is symbolic of a universal wholeness, a state of mind that can only give of its complete perfection. The concept of "getting" something in return for something else is utterly meaningless in the present moment. Right now, there is only rest, contentment, and fulfillment." As you release false beliefs and attack thoughts your perception of the world and relationships will change dramatically. Witnesses that are in alignment with your new found Purpose will abound in awareness. Miracles will fill your holy mind and people will seem more like angels than human beings. You sisterly love is a beautiful reflection of the Purpose we share, and you will see that you are free to fully express this love without limits or restrictions of any kind. It is the Joy of our Heart to express the Unconditional Love of God, and you will gain confidence in this expression each time you allow Love to flow through you. The Calls for Love in our brothers and sisters have been the Call to Love within. You are aware of Love through extending it, and all perceived hurts are only opportunities to let go of illusory beliefs and appearances. Real Relationship: God and Creation. Stepping through this doorway will help you to be aware of some of the typical egoic resistances and pitfalls that attempt to sabotage you along the way. It serves as a support for your mind as you turn towards a powerful new way of finding what it is you are and have always been!